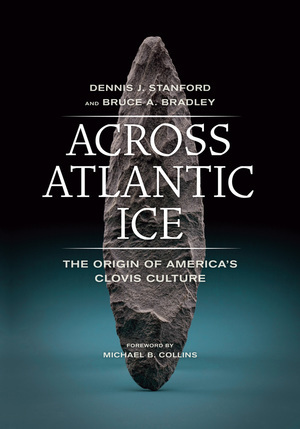 For decades the Clovis culture has been our anchor to understanding the peopling of the New World. It has been a touchstone for archaeologists, a rare "truth" and comfort regarding the unknowable archaeological past. They have recognized who was first in the Americas and whence they came. Even so, the interest in just how they came to be and where they came from has driven Clovis research, which has resulted in questions challenging even our very basic beliefs. What is the evidence that has started to shake the foundations of this long-accepted theory? Could it be that there were people in the Americas before Clovis? The amount of evidence for Clovis has grown at a relatively fast rate since the first discovery of this archaeological culture. Clovis points have been found throughout most of continental North America, extending from the Atlantic to the Pacific, and from the plains of Alberta, Canada, into northern South America (figure 2.1). The wealth of data provided by the excavation and analysis of Clovis sites is giving us a new understanding of Clovis culture. Although Clovis hunters killed now extinct ice age animals, a conservative view of radiocarbon dates indicates that these people first appeared in the New World some 13,000 years ago, and in less than 200 years they had explored, exploited, and inhabited the two continents of the Americas. By comparison, the historic European residence in the Americas began barely 500 years ago. If the actual tenure of Clovis is only 200 years, they achieved the most rapid terrestrial expansion and extensive colonization in the history of pre-literate people. The Clovis expansion across the Americas coincided with a period of dramatic climatic fluctuations that altered landscapes and their associated resources. Clovis people must have been highly adaptive generalists who could take advantage of a wide variety of resources. Their secular worldview must have centered on the edible and the inedible and how to attain the former. At the end of Clovis times we see users of descendant technologies adapted to every available ecological zone: tundra in the north; boreal forest with deciduous and coniferous woodlands in the northeast; deciduous forest and parklands; mixed hardwood and piney woods in the South; pluvial lakes and rivers in the relatively arid plains; desert in the southwest; and the tropics of Central America. Moreover, dredging along the Atlantic coast and sports divers on the Atlantic continental shelf have recovered Clovis artifacts from an ocean margin environment. Although Clovis sites and artifacts are rare on the West Coast and in the Great Basin and range country, scattered evidence around pluvial lakes and river courses suggests at least minimal Clovis occupation of these areas. Fluted projectile points are the most readily identifiable Clovis artifacts, but there are many other items that make up the Clovis inventory. Among these are tools made from blades and flakes struck from specialized cores, plus bifacially flaked knives and adzes. Bi-beveled bone, antler, and ivory rods of unknown use, foreshafts (made to hold projectile points for use with a spear shaft), and projectile points as well as barbed harpoons are also characteristic of Clovis. The history of Clovis archaeology has had a profound influence on our perception of Clovis culture. The first recognized sites, Blackwater Draw and Dent, were found in semiarid environments; both included mammoth remains. Many other Clovis localities were subsequently discovered in the West. But even though archaeologists have become aware that the climate and landscape of North America were much different at the end of the Pleistocene than they are today, the popular view of Clovis continues to emphasize mammoth hunting in an arid to semiarid region. Yet Clovis artifacts and sites with Clovis-like fluted points have now been found from coast to coast and from Canada to as far south as Venezuela. In North America, Clovis artifacts are relatively rare in the northeastern and north-central states, and some scholars believe this is because these areas were then recently deglaciated and not settled until late in Clovis times. Clovis sites are most abundant in the Mid-Atlantic and southeastern states and exhibit a wide diversity of activities, whereas diversity decreases to the north and west, where activities are focused on hunting. Western sites are either small campsites or kills that are sometimes associated with small temporary hunting camps. To the east and southeast, by contrast, they include not only kills but also stone processing areas, usually associated with large campsites; large overlook and upland surface sites; and at least one cave/rockshelter. Some of these differences in settlement patterns and site types may be the result of preservation or just plain luck in finding sites, but consistent patterns are emerging. The archaeological evidence suggests that the contrast between the east and the west can be explained by the late ice age prairie-forest border. The abundance of resources in the woodlands allowed at least semi-permanent settlements, while the prairies, plains, and deserts offered large game but little else at the time. Because plant and animal habitats were responding to abrupt and fluctuating climatic changes at the end of the ice age, this margin cannot be identified with great precision, but the general distribution of different Clovis site types gives a general indication of the location of this change. Evidence of Clovis dwellings is sparse. Based on lack of evidence to the contrary, it is presumed that Clovis people occupying western sites had highly portable or ephemeral structures, but even hearth features are almost nonexistent. In the east, where larger campsites have been found, one would expect evidence of more substantial housing because of the length of time people could remain in this area. By and large, however, this is not the case, save for the appearance of a pattern of post molds at the Thunderbird Site in Virginia from which Errett Callahan has reconstructed the shadowy outline of a rectangular longhouse. If the evidence from Thunderbird has been interpreted correctly, the people who lived there may have constructed longhouses at sites where they intended to reside for extended periods or those to which they returned on a regular basis. A discovery at the Gault Site in central Texas provides another example of a possible Clovis dwelling. This is a square cobble pavement with straight sides and distinct corners that measures almost 2 square meters. The sides of the pavement line up with the cardinal points (figure 2.2). As the Texas archaeologist Mike Collins has pointed out to us, the odds against this happening randomly are 90 to 1 (based on a 360 degree circle). The structure is in what would have been a wet valley bottom in fine clay deposits. Surrounding this pavement and resting at the same elevation is a scatter of blades, biface fragments, limestone clasts (possibly artifacts), and bone fragments, leaving no doubt about the pavement's association with an occupation. Collins's recent re-evaluation has questioned the Clovis association based on the lack of diagnostic Clovis artifacts as well as a series of dates indicating that this feature and its associated artifacts may be older than Clovis. Investigations into this issue continue. There is, of course, a lot of speculation about how the feature was used. A likely possibility is that it was the floor of a small structure, constructed to elevate the occupants above the damp valley soil. Blade segments with evidence of grass and reed cutting were associated with the feature, and Collins imagines that the pavement was laid down and then covered with grass or mats, which in turn may have been covered with hides, making a comfortable platform on which to sleep. It is also possible that reed mats were used as walls to enclose the structure. Another Clovis cobble pavement was discovered in 1948 in Texas at the Kincaid Rockshelter. This pavement covers a significant portion of the Clovis occupation level (there are more uses of the site in archaeological layers above Clovis), and artifacts and bones from food refuse were found in the cracks between the cobbles. A water seep presently keeps the interior of the shelter wet, and if the soil was damp during the Clovis occupation the cobbles may have been used to provide a dry surface. Why Clovis people selected this wet cave among the many dry caves throughout Texas remains a mystery. Nevertheless, these two sites establish pavement as a method known and used by Clovis people. In order to understand the intensity and use of the Gault Site, intensive refitting analysis has been done there. Flaked stone artifacts are checked to see if knapping sequences can be reconstructed by fitting flakes into flake scars on flakes, cores, and tools. If pieces found near each other fit together, it is likely that they were made and used in that location, and if people used the site only temporarily, especially as a manufacturing locality, one would expect a lot of the remains to be clustered in refittable clusters. On the other hand, if there is a lack of fittable pieces it means there was substantial mixing of artifacts caused by long-term camping activities. The Gault study identified few refits. Since there is little indication in many of the deposits of natural processes moving the artifacts, the paucity of refits probably resulted from human activities that moved individual pieces away from where they were made. Moreover, tools of local chert that were used, worn, refurbished, worn out, and finally discarded are common in the collection and indicate that the Gault occupations were intense and long-term enough to result in this thorough mixing and reuse of artifacts. Another example of a large Clovis site is the Carson-Conn-Short site on the ice age banks of the Tennessee River, which overflow waters from Kentucky Lake currently seasonally inundate. Although this site has been only preliminarily tested, it appears to be a major Clovis camping area associated with a chert source. A meter or more of midden (cultural refuse) is spread continuously along the terrace for up to a kilometer. The occupation debris probably accumulated from both long-duration encampments and repeated shorter visits during quarrying activities. Although the brief tests have recognized no evidence of dwellings, the presence of storage pits and possible heat-treating features indicate that this site has great potential for producing evidence of shelters if and when more detailed excavations are conducted. Almost fifty years ago Ron Mason observed that there were significantly more fluted points reported from the southeast than from the rest of the continent and that there was more variation in fluted point forms and technology in the east than in the west. Following the age-area hypothesis that the greatest number and variations of traits will occur near their center of origin and decrease as they defuse outward, he suggested the southeastern United States and not the West as the homeland of the Clovis complex. Mason's estimates of the number of fluted points were based on impressions, not on empirical data. But as the years passed, surveys reporting eastern fluted point finds and sites increased at a rapid rate, while western finds remained relatively rare. Twenty years later Louis Brennan, the editor of Archaeology of Eastern North America (AENA), in an effort to revive Mason's hypothesis, organized and published a compilation of eastern fluted points. The AENA compilation covered the cis-Appalachian East from Quebec to Florida and recorded more than 5,800 points. Although the leading experts on Paleo-Indian archaeology were impressed by the data, they all agreed that the abundance of specimens alone was not proof of the antiquity or ultimate origin of Clovis. Even if the compilation demonstrated that there were more Clovis points recorded from the East, there were likely appropriate explanations-for example, the carrying capacity of the eastern habitats may have been more favorable to population growth, or there may simply have been more artifact collectors and archaeologists working in the East, where decades of agricultural activities likely plowed up more artifacts. Conversely, if there were fewer Clovis points recorded from the West, it was likely that greater erosion there had destroyed many Clovis sites and re-deposited fluted points. A study by the archaeologist Brad Lepper found a positive correlation between the numbers of fluted points reported from Ohio and the amount of acreage under cultivation and associated with contemporary population centers. Can we evaluate whether or not a greater density of eastern Clovis points reflects better artifact visibility due to erosion and cultivation, plus more intense scrutiny and focused inventories? Certainly there are places where surface exposure is limited in the West, but this is not characteristic of most of the area. Who were the first humans to inhabit North America? According to the now familiar story, mammal hunters entered the continent some 12,000 years ago via a land bridge that spanned the Bering Sea. Distinctive stone tools belonging to the Clovis culture established the presence of these early New World people. But are the Clovis tools Asian in origin? Drawing from original archaeological analysis, paleoclimatic research, and genetic studies, noted archaeologists Dennis J. Stanford and Bruce A. Bradley challenge the old narrative and, in the process, counter traditional—and often subjective—approaches to archaeological testing for historical relatedness. The authors apply rigorous scholarship to a hypothesis that places the technological antecedents of Clovis in Europe and posits that the first Americans crossed the Atlantic by boat and arrived earlier than previously thought. Supplying archaeological and oceanographic evidence to support this assertion, the book dismantles the old paradigm while persuasively linking Clovis technology with the culture of the Solutrean people who occupied France and Spain more than 20,000 years ago. Dennis J. Stanford is Curator of Archaeology and Director of the Paleoindian Program at the Smithsonian’s National Museum of Natural History. Among his books is Ice Age Hunters of the Rockies. Bruce A. Bradley is Senior Lecturer in Archaeology at the University of Exeter and Director of its Experimental Archaeology Programme. His books include Clovis Technology.